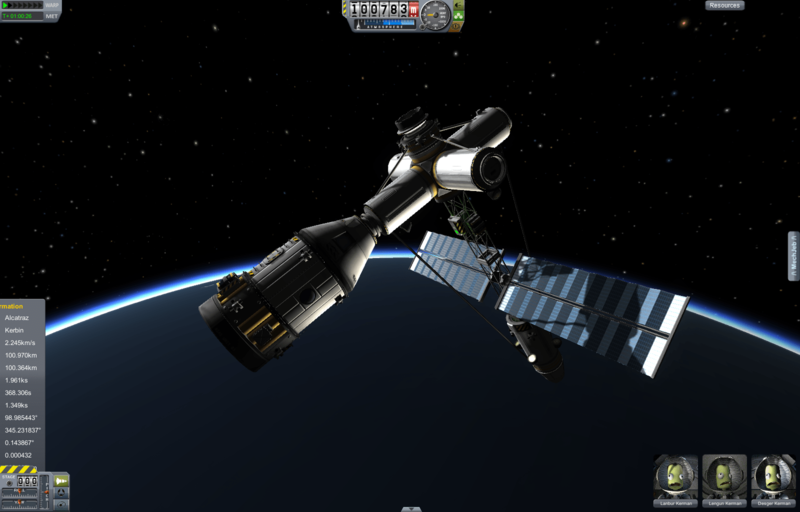 KSP: docked with Blarney Space Station | Something Odd! 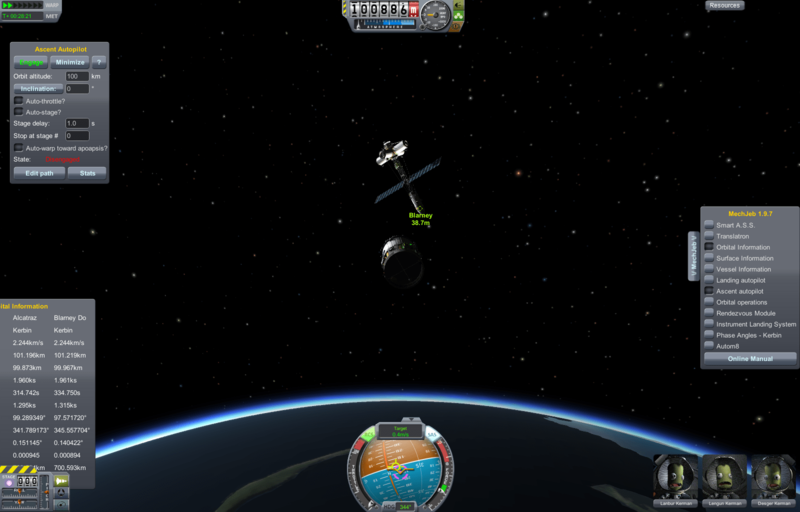 Wow, Kerbal Space Program can really test your stamina. 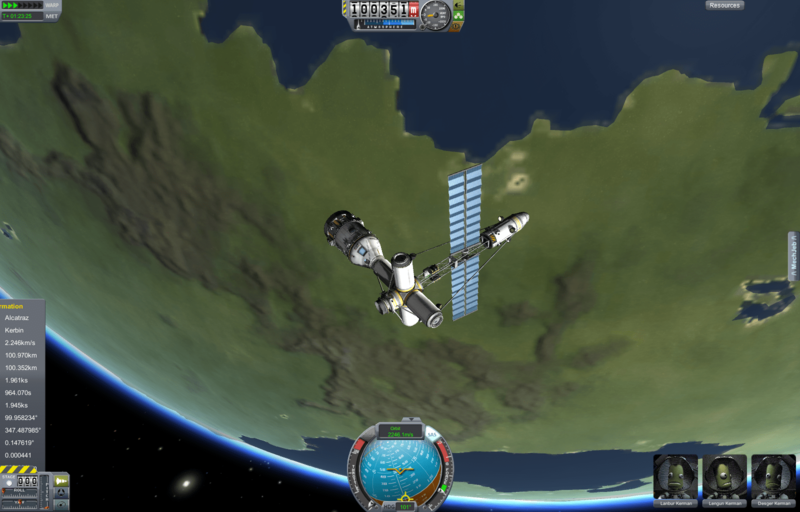 I finally docked a crew quarters with my space station this evening. It almost broke my heart and resolve to play this game but after taking a break from it I tried again. After a number of manual test launches I reluctantly enabled the “ascent autopilot” because my rockets were blowing up so often it was getting tiresome. I eventually went overboard and used 4 mainsail rockets and the huge orange fuel tanks. It wasn’t pretty, but it worked! On “final” approach. I had to repeat this several times to line up. Crew quarters and 3 Kerbals docked with the space station. Note the illumination lighting up the station. I messed up when I built the station. There’s a docking bay at the end but it’s turned the wrong way. Argh! Kerbal Space Program is at times (most of the time) a frustrating and difficult game to play but also has these (too infrequent) joyous moments when something goes right. It took more than a dozen attempts to launch the crew quarters and monopropelent into space and when I finally managed to dock I had a tiny amount of the fuel left. Scott Manley makes it look way too easy! Scott has some great tutorials but AddMeGamers has some very good ones too that are worth checking out too. Be sure to check out r/kerbalspaceprogram on Reddit as there’s an influx of new players and plenty of help given. The game recently became available on Steam and it immediately jumped into the top 10 best sellers so I guess there are lots of people sharing my frustration. Great game however, I definitely recommend it! Next PostNext 3 months free Backblaze cloud backup!